photo: globeequipment.com Panini' means 'bread' in Italian. Although Italians have been eating bread for over two thousand years, modern day Italians regard a panini as a sandwich made with any bread that is not sliced. The classic way to make a panini is to cut a bread such as ciabatta or focaccia horizontally, scoop out much of the inside, then fill it with meats, cheeses or vegetables. The bread is then coated with spreads such as mayonnaise, pesto, mustard or any number of homemade mixes using olive oil, garlic and herbs. 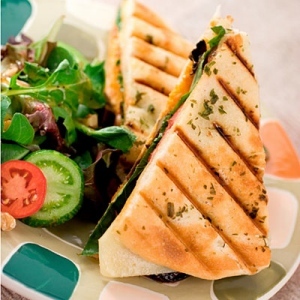 Paninis are often grilled, with most panini lovers preferring to 'press' the sandwich onto the grill. This method melts and blends the ingredients inside the bread, while lightly toasting the outside. For best results, use a panini press. However you don't have to be a purist to enjoy a panini. Use sliced bread if you like, and if there isn't a panini press available, don't worry. A delicious panini can also be made in a skillet, fry pan, toaster oven, griddle or regular oven. Buon appettito! Recipe.com calls this a "salad in a sandwich". However you term it, it's a mouth watering way to serve a healthy portion of protein, along with a side of romaine. With the Parmesan dressing adding a delicious punch, even a picky eater will finish this panini...lettuce and all. In a blender, combine lemon juice, garlic, 3 tablespoons Parmesan, the Worcestershire and pepper until blended. With motor running, slowly pour in oil until well combined. In a large bowl, combine chicken and lettuce. Stir in 2 tablespoons dressing, mixing to coat well. Split bread in half horizontally. Scoop out inside of bread, leaving crust shell. Brush bread shells with remaining dressing, then sprinkle on the remaining Parmesan cheese. 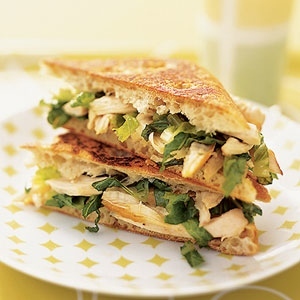 Place the chicken mixture on one shell of bread; top with other shell to create sandwich. Firmly press sandwich to seal. Heat a nonstick pan over medium-high heat. Spray top and bottom of sandwich with vegetable cooking spray. Place sandwich in pan, then put a cast-iron pan on top and push down (you can use any heavy pan, or cook the sandwich in a panini maker). Cook two minutes. Remove heavy pan and carefully flip sandwich over. Cover again with heavy pan, and cook two minutes longer. Serves 5. 503 calories per serving. Not every panini is served warm. 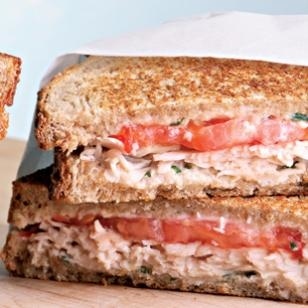 Here is an easy panini version of tuna salad -- no cooking required. Blend olives, capers, garlic, zest, and 3 tablespoons artichoke marinade in a blender, scraping down sides frequently, until as smooth as possible, 1 to 2 minutes. Transfer mixture to a bowl and stir in mayonnaise. Stir together artichokes and tuna in another bowl. Split each roll horizontally and remove inner crumb from top half. Spread olive mayonnaise on cut sides of rolls and make sandwiches with tuna & artichokes. Season the filling with pepper. Top with parsley and sliced tomato. Depending on how much cheese and sauce is added, paninis can be a higher calorie dish. However it is simple to make a low calorie version. With this healthy veggie panini, the feta cheese adds very little calories -- but a whole lot of flavor. Heat a medium-sized skillet over medium-high heat. Add garlic and onion, and cook for two minutes. Add zucchini and mushroom. Cook for additional four minutes, or until vegetables are tender. Stir in red wine vinegar and salt. Heat a panini press or two-sided skillet. Top 4 slices of the bread evenly with the vegetable mixture and 1 oz. of the feta cheese. Top each panini with one slice of bread, and grill for four minutes, or until the cheese is melted and the bread is crisp. Serves 4. 230 calories per serving. Most of the cooking time for this panini is spent preparing the roasted garlic mayonnaise sauce, (a lower fat version of the French aioli sauce that uses egg yolks). While the garlic cloves are roasting, assemble the rest of the ingredients. Once the garlic mayo is ready, it should only take about five minutes to put together the panini and cook it. Btw, you can use low calorie mayo for the aioli, Either way, the sauce and the panini will make quite an impression. And feel free to substitute Mozzarella or Provolone for the Fontina cheese. To prepare roasted garlic mayonnaise, peel garlic cloves. Toss garlic cloves with olive oil. Place on a piece of aluminum foil and fold closed. Place in preheated 350 degree oven and roast until tender, about 20 to 25 minutes. Transfer garlic to bowl and mash completely. Add mayonnaise and mix until well blended. 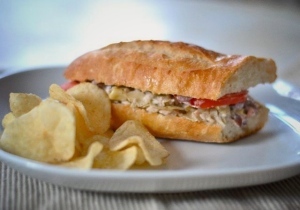 To assemble each sandwich, spread 1 tablespoon of the roasted garlic mayonnaise on one slice of Italian bread. 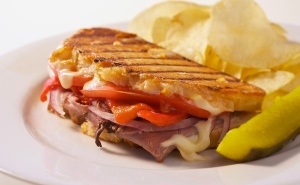 Top with 2 ounces roast beef, two slices onion, 1 1/2 ounces peppers, 2 slices tomatoes, one slice Fontina cheese, and the top slice of bread. Spread top and bottom of sandwich lightly with olive oil to coat bread. Place sandwich on heated surface of Panini grill. Cook on both sides until crust is nicely browned and middle is heated. Serves 4. 410 calories per serving. The combination of creamy Parmesan and fresh basil packs an extra punch to this turkey and tomato panini. It's so tasty, you won't believe how few calories and fat it contains. Btw, this recipe assumes you don't have a panini maker, and its instructions on how to make a proper panini without one are simple and effective. Of course, if you do have a panini maker in the house, just proceed as usual. Have four 15-ounce cans and a medium skillet (not nonstick) ready by the stove. Combine mayonnaise, yogurt, Parmesan, basil, lemon juice and pepper in a small bowl. Spread about 2 teaspoons of the mixture on each slice of bread. Divide turkey and tomato slices among four slices of bread; top with remaining bread. Heat 1 teaspoon oil in large nonstick skillet over medium heat..
Place two panini in the pan. 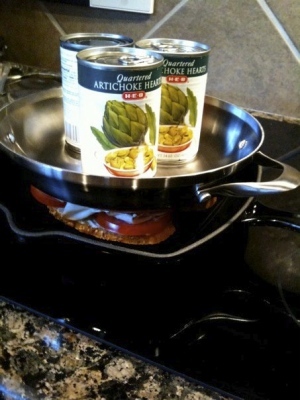 Place the medium skillet on top of the panini, then weigh it down with the cans. Cook the panini until golden on one side, about 2 minutes. Reduced the heat to medium-low, flip the panini, replace the top skillet and cans, then cook until the second side is golden, 1 to 3 minutes more. Repeat with another teaspoon of oil and the remaining panini. This panini recipe is the closest thing to an Italian grilled cheese. It takes so little time and tastes so good, there's no excuse not to grill this panini for an easy, last minute meal. 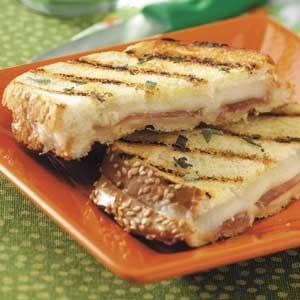 On four slices of bread, layer a slice of cheese, a slice of prosciutto and a second slice of cheese. Brush both sides of sandwiches with oil; sprinkle with sage. 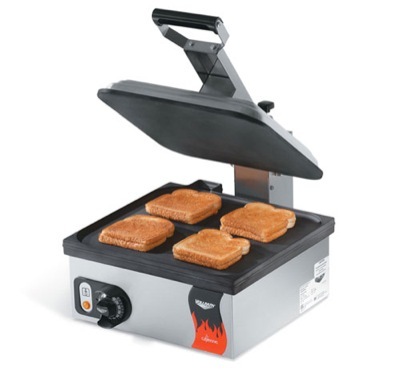 Cook in a panini maker or indoor grill until bread is toasted and cheese is melted. This recipe was found on the informative With Style and Grace site which offers a number of gluten-free recipes. 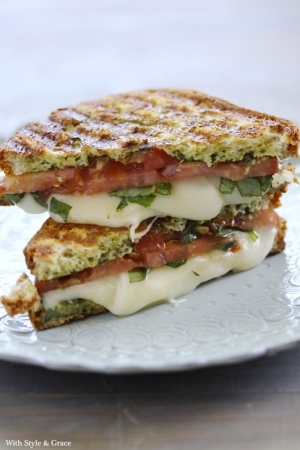 And since ''Caprese' is a shorter way of saying 'tomato, mozzarella and basil', this panini is both gluten-free and vegetarian. It's also delicious. Turn on panini machine, or heat grill pan. To prepare sandwiches, take 2 slices of bread and spread a thin layer of pesto on one side of each piece. Add 2 slices of tomato on top of one piece (pesto side up). Add mozzarella slices on top of the tomatoes. Sprinkle with basil and top with second piece of bread, pesto side down. Brush both sides of panini with olive oil. Put the sandwich onto the frill, press down the top of the grill and let sit for 5-7 minutes, or until cheese is melted. Remove, cut in half and serve immediately.